The letter is said to have been written by Ralph Ouseley, who owned the harp in the early 1780s. 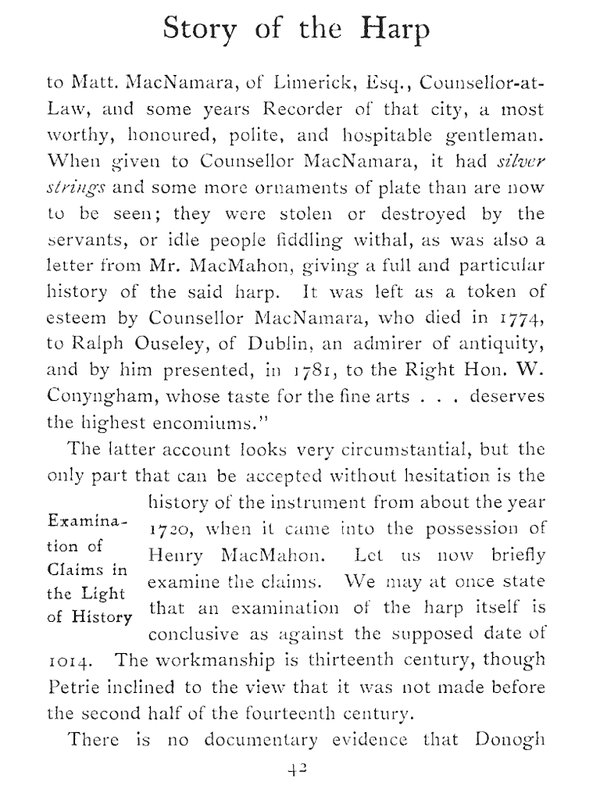 Macnamara acquired the harp in about 1756. 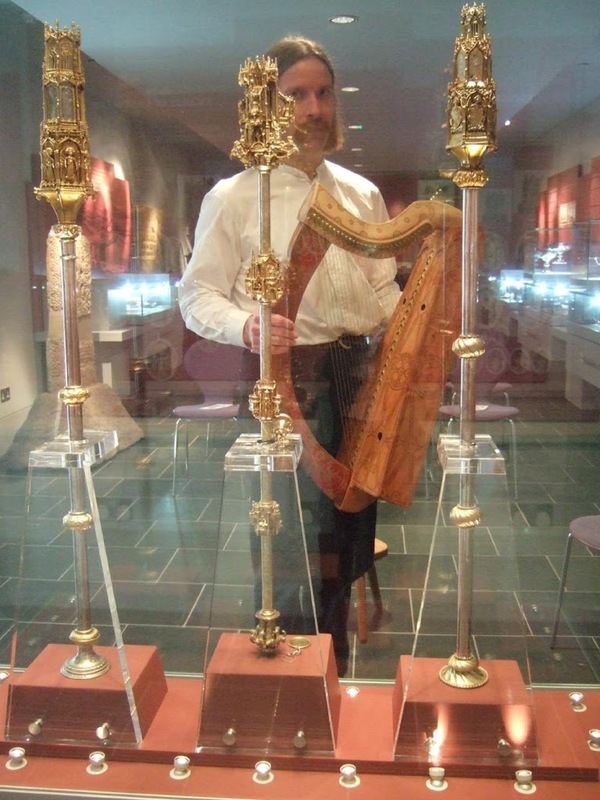 If this is true then it is an exciting and important piece of information both about the Trinity College harp itself, and also about the use of precious metal strings on the old Gaelic harps. 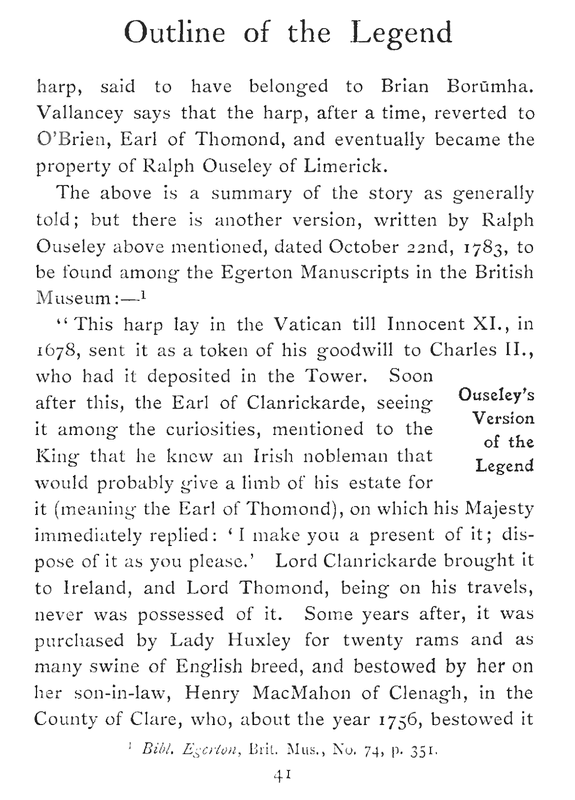 I contacted the British Library, and put in a request for a copy of this manuscript page. After some confusion and digging on the part of the librarians, (and a rather eye-watering fee on my credit card for their troubles) I was sent a high-res page scan of British Library, ms Egerton 74 f184. This page contains a transcription made by J. Hardiman in 1820, of the Ouseley letter, and Grattan Flood is vindicated – it really does say that the harp had silver strings on it. I was delighted that my expensive gamble in ordering the manuscript page had paid off – worth its weight in silver you could say! So I wonder, what is the story here? 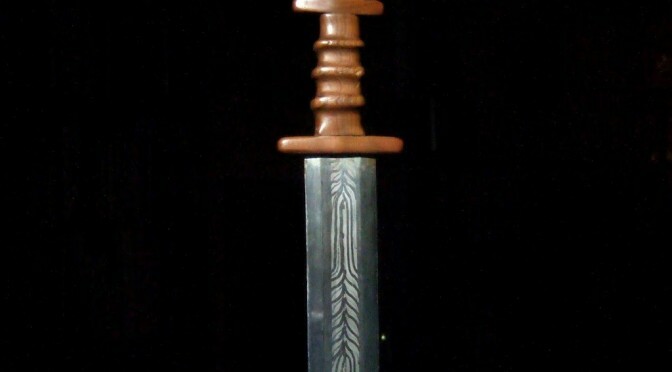 Was the harp strung entirely with silver? Or did it only have a certain section of the strings left? 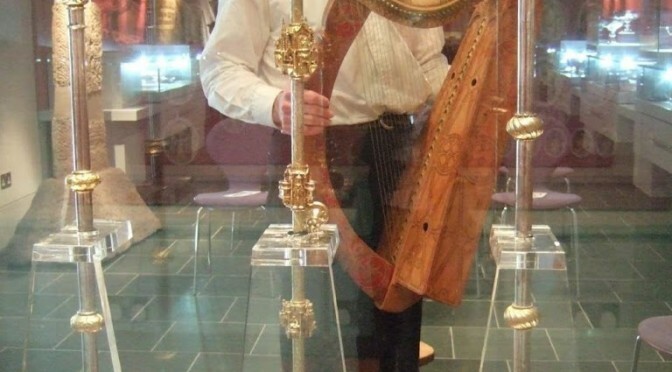 I have seen a photo of an 18th century Irish harp (one of the Malahide / Kearney ones) which had all of its steel trebles on but none of its brass basses; brass being more valuable to remove and recycle I suppose. When were these silver strings installed on the Trinity College harp? 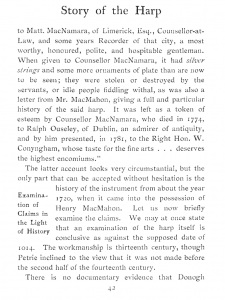 There is no suggestion that the harp was played in the early 18th century; Arthur O’Neill in about 1760 implies that the instrument was not played for 200 years before then. Were these silver strings the remains of a 16th century setup? 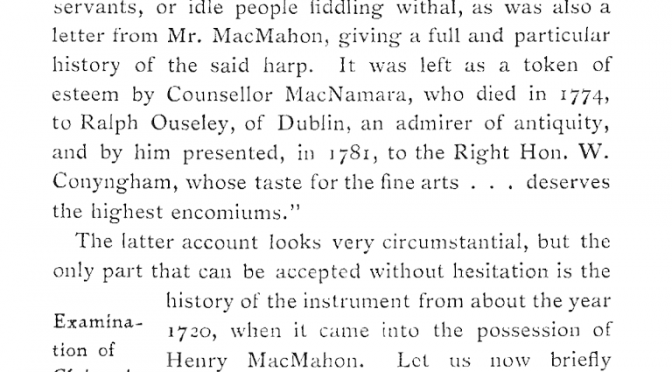 The genuineness and authority of this statement from an 18th century owner of the harp makes me want to start experimenting again. How does it work to fit silver strings to the entire range? Can it be taken up to the high treble? What alloys work best for this? Ann Heymann tells me she has had a low-headed medieval Irish harp strung entirely in silver, but more experiments are needed! A sneak preview for readers of my blog! 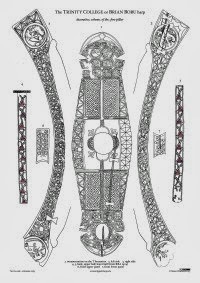 I have made a drawing of the forepillar decoration on the Trinity College harp. This has never been done before; when R.B. Armstrong studied the harp for his 1904 book, he did not draw the pillar decoration, saying it was probably later work. And no-one has done a good published study of the harp since then. I have been admiring the pillar decoration on my vists to Dublin for a few years now, and I managed to get enough closeup photos to be able to work out almost all of the decoration. I have drawn it all out schematically, following the general principle of Armstrong’s superb diagram of the decoration of the Queen Mary harp forepillar. I very much enjoyed doing this work; the decoration is really complex and busy and it was a real challenge to trace the twists and turns of each vine stalk and interlace strap. I’m publishing the drawing officially on 1st October, both as a free PDF download that you can get from the Trinity pillar decoration webpage and also as a 2-colour A3 sized digital print on good art paper that you can order from the Emporium prints page. Be sure to read the rest of the Trinity pages as I have added some other interesting information and illustrations. On Wednesday, I’m performing for the Friends of Wighton lunchtime concert in Dundee. For something a bit different I thought I would try to put together a half hour recital using only the bowed lyre. The theme of the concert will be a tour round the ancient north of Europe. I’ll play a tune or two from all of the places that have a bowed lyre or bowed harp tradition – Karelia (Finland/Russia), Sweden, Shetland, Iceland, maybe even Canada, and also some English Irish and Scottish tunes. The half-hour concert will be held upstairs in Dundee Central Library. The concert is on Wednesday 2nd October, starting at 1.15pm. Admission is free. More experiments with moonlight photography. There are two interesting stanes in St Andrews, and the other day I went and photographed both of them for you. The Black Stone is on display in a glass case in the Museum of the University of St Andrews, though I remember years ago before the museum was opened, seeing the Black Stone standing in the big fireplace in Parliament Hall, below the old library. Apparently it used to be used as the ritual seat on which MA candidates would be seated, for their oral examination, and it was used for this purpose from c.1420 (when the University was brand new) through to the 18th century. 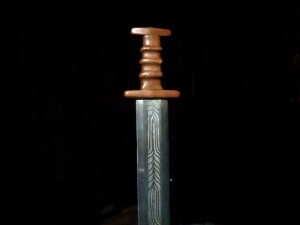 It looks like it may be a Roman pillar capital; the bands are gilded, and it is extremely black. It is obviously connected to other ritual stone seats such as the Stone of Scone at Edinburgh Castle, and the Frith Stool in Hexham Cathedral. The Blue Stane stands behind high railings, outside a pub of the same name, on one of the roundabouts on City Road, a hundred yards or so outside one of the old medieval gates of the city. It has moved around a bit over the centuries (since its first appearance on a 1580 map) but has always been beside a road outside the West end of the city. It is a kind of Dolerite from Drumcarrow Craig a few miles west. 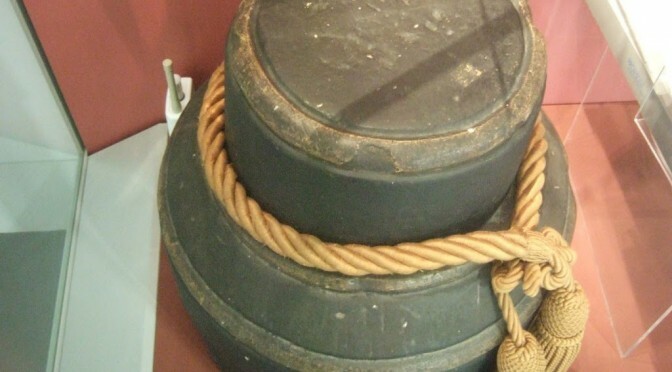 In olden times, men would pat it and women curtsey to it as they passed. 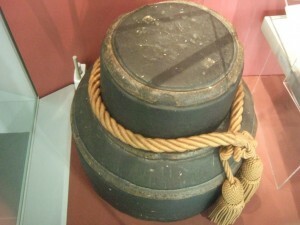 It is said to have been King Kenneth MacAlpine’s coronation seat in the 9th century. 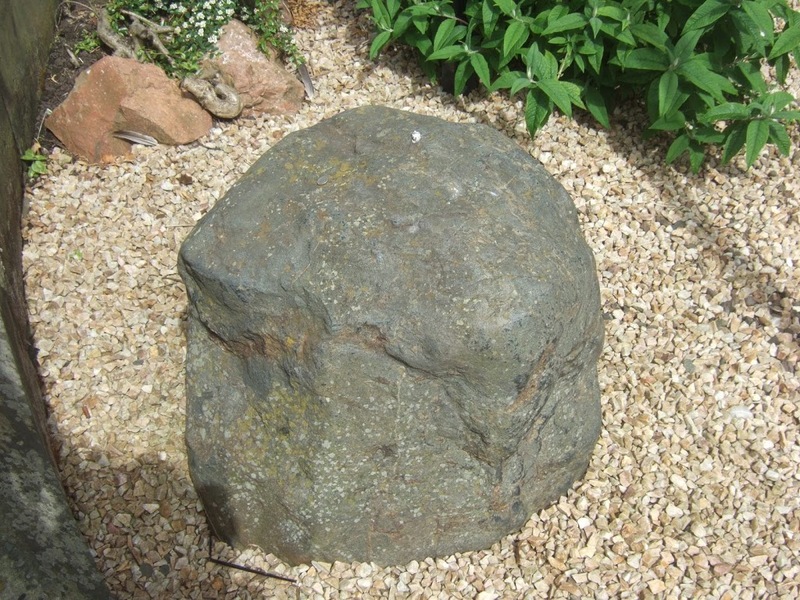 Apparently there is another blue stane outside of Crail kirk but I have not seen that one. A German or Scandinavian harper in Ireland c.1800? 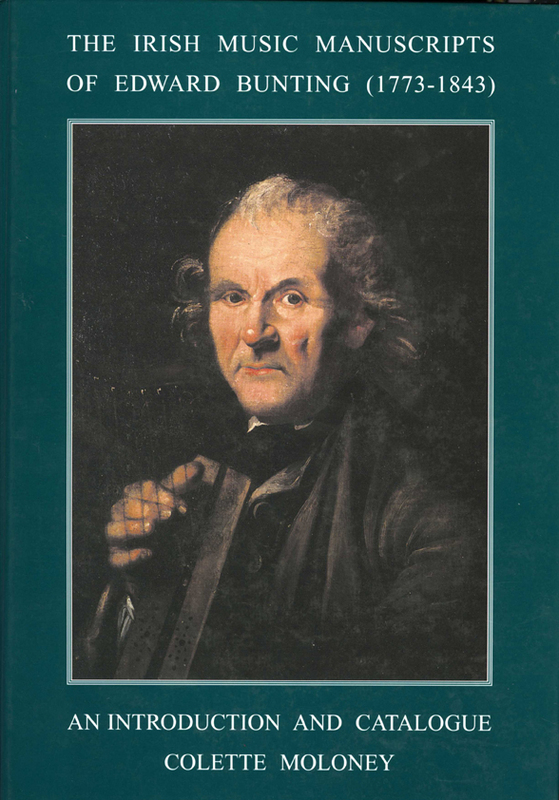 The front cover of Collette Moloney’s book, The Irish Music Manuscripts of Edward Bunting, an Introduction and Catalogue, published in 2000 by the Irish Traditional Music Archive, shows an oil painting of an elderly gentleman holding a harp. 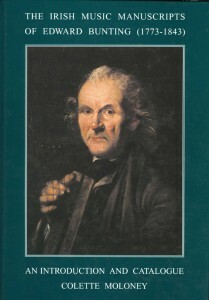 The caption on the back of the book says “Front cover ‘A Portrait of a Harper’, Irish School, c. 1800 (formerly attributed to James Barry: courtesy National Gallery of Ireland)”. 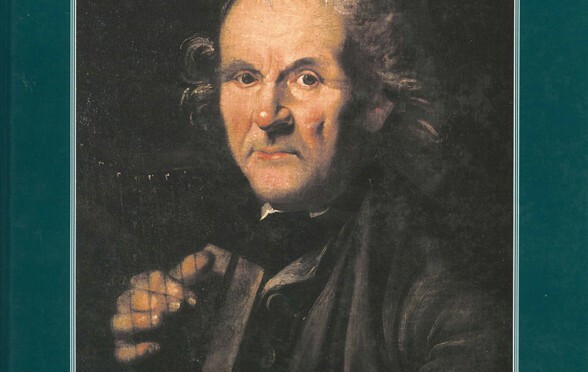 So if we trust the art experts who give these very definitive sounding opinions, this is a portrait painted in Ireland by an Irish artist about the year 1800. But who is the harpist? I long ago recognised that the harp in the painting is of a type known today as a ‘Bohemian harp’, it is a type of instrument that was native to Germany but was also widely used in Scandinavia. The most diagnostic part of the harp really in this painting is the little soundholes arranged in a cross shape. But other aspects of it – the general shape of the instrument, the pale soundboard compared to the dark wood of the rest of the instrument, (not to mention the very un-Irish right hand treble) all indicate it is a German or Scandinavian harp of the late 18th century. (Once I realised it was a German or Scandinavian harp in the picture, I started thinking that the man’s face looked quite Germanic as well). Just this week I was looking at the online facsimiles of the Journal of the Folk Song Society of Ireland (more info on my Bunting mss page) and I noticed, in an article about Samuel Fergusson (vol vii p.11), a mention of the Swedish harpist Herr Sjoden, who visited Ireland in 1879. I have not yet found a portait of Adolf Sjödén (1843-1893) for comparison – could he be our man I wonder? Posted on 12th September 2013 4th October 2014 Categories UncategorisedTags Ireland, mystery, painting, portrait3 Comments on A German or Scandinavian harper in Ireland c.1800?